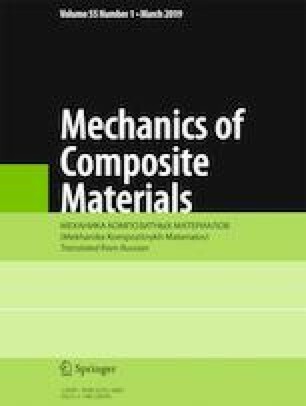 With the example of a silicon dioxide-filled 3D cross-linked plasticized elastomer based on a SCID-L highmolecular copolymer, the theory of structural-mechanical behavior of the polymer composite material has been tested experimentally. Theoretically calculated values of mechanical fracture energy are compared with experimental data, including the construction of their locus in uniaxial tension at temperatures of 223-323 K. The difference between theoretical and experimental data does not exceed 5%, which is acceptable for the engineering practice. Translated from Mekhanika Kompozitnykh Materialov, Vol. 55, No. 1, pp. 91-98, January-February, 2019.